Before to click play, you have to know this video might ruin your day. The author of the video doesn't give any explanations, he just says " we had to destroy this dodge viper . 4 more to go ". 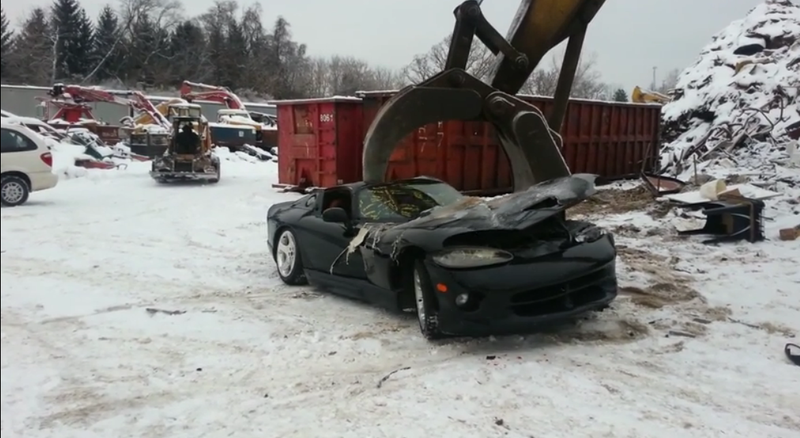 The unlucky Dodge Viper you see in the video is not a replica and we don't know if the engine is broken or it has something irreparable, but watching it being smashed in a junk yard is just wrong! Could have at least broken it for parts !! they go to buy a prius =D l ol l ol good 1 dude make more viper lamborgini ferrari all the same people that dont know what make to the money ! Another junk put it the trash!! Somebody has too much money or what? Sono delle merde! Vorrei vedere loro al posto della Dodge Viper! Brutti coglioni che non siete altro! I know there's a British thing where if the car was used for drug purposes, it must be seized and destroyed. Top Gear had a heavily modded Lancer Evo that was condemned by the court to be destroyed. They'd convinced the court to let them have some fun with it as a last hurrah, destroying it in the process. I agree. This is completely insane, but they likely do not have a choice. Reason behind the destruction of these cars..... The two that I had to destroy came from schools in the area's auto shops. Chrysler Corp removed these cars from schools across the country because 1 student supposedly stole one from a school and was killed in it. I don't know how true this stands but I can tell you that a rep from Chrysler was there to verify the destruction of this car and to make sure there was not a salvageable part left. I am unsure how many vipers are to be destroyed. I was told each state has a few or so"
I go to college in Milford, Nebraska and we had to destroy a viper in a similar fashion today for the very reason stated above.